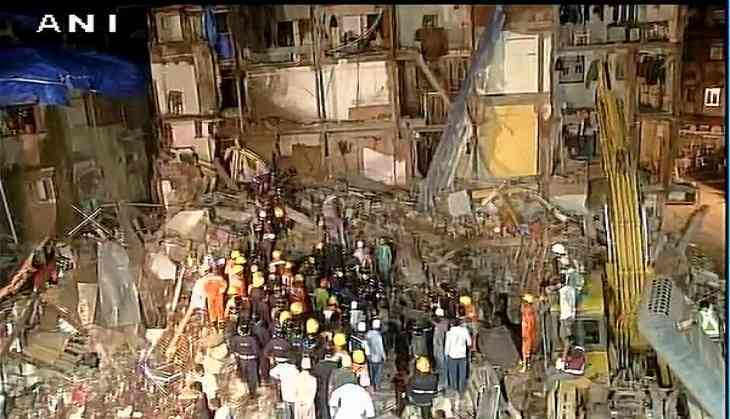 A total of 47 people have been rescued in the Bhendi Bazaar building collapse here. Till now 32 people have lost their lives, while 15 have been injured. Earlier at 31 August midnight ten fire engines and quick response team , two rescue vans, one house collapse van, ambulances, about 70 fire personnel, one National Disaster Response Force ( NDRF) team, two pock lane, six JCB and 16 dumpers were working for rescue operations. The three-storey Husaini building collapsed in Mumbai's Bhendi Bazaar area on 31 August. Meanwhile, Maharashtra Chief Minister Devendra Fadnavis announced an ex-gratia of Rs. 5 lakh for the kin of those who died in Bhendi Bazaar building collapse. Taking stock of the situation the Chief Minister also assured that action would be taken in case of any negligence in the incident. The Chief Minister visited the accident spot and also ordered a detailed enquiry into the matter. "Action will be taken in case of any negligence. I am personally monitoring the situation," Fadnavis told the media here. The Chief Minister also directed the Bombay Municipal Corporation (BMC) Commissioner to focus on immediate medical assistance to the injured persons. The injured people have been admitted to the J. J. hospital for the medical treatment.